Radio-Frequency Identification, yes this is the full form of the nowadays popular tech word RFID. RFID refers to small electronic devices that consist of an antenna and a small chip inside the device. In real this small chip is not very much small instead it is capable of crying 2000 bytes of data or less. The one RFID device serves the same purpose as a magnetic strip or barcode serves, it generates a unique ID code for the object in which it is laid on. And in order to retrieve the identifying information the RFID devices are scanned just like the magnetic strip or barcode. RFID device does not need to be positioned precisely relative to the scanner. Unlike previously used technologies. RFID devices work within a few feet of the scanner. For instance, after purchasing the products from a grocery shop or departmental shop you do not need to take out every product from the basket, one just need to set the bag on the scanner. The scanner will be able to query all of the RFID devices and sum the products within a fraction of seconds. 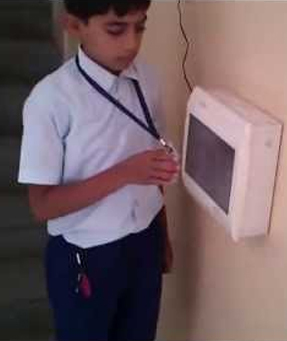 Automated updates to parents of their childen at the time of arrival and leaving school premises. Automatic SMS to Parents of Absent Students. Monthly Attendance Reports of students. Manual Entry Option for student who forget his/her ID card. Track your staff by biometric attendance. And increase the staff attendance ratio. Web based interface , can be monitored from anywhere fromworld. Wireless professionals Plug and play system Just need to switch the power on When power is not availabIe it works With power backup. It is user fnendly no need of skilled.